Artist Notes: This is a second story I claimed in the first minibang in nekid_spike community. 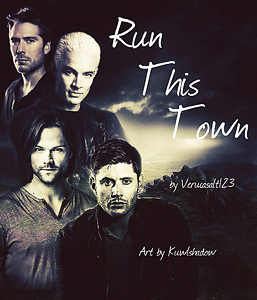 Like the other story I claimed this, too, is a Supernatural crossover. Hard to pass that up. When I am able to provide the link, please take the time to read verucasalt123 awesome crossover BTVS/SPN story. Thanks to nekid_spike for this wonderful opportunity. Background credit goes to wyldraven. Wow, that's a very good looking banner! I'm sure verucasalt123 will be very pleased with it.